This one is shorter than the other cloche style hats and is about the same length as a standard round cap designed to cover most of the ears. It's part rainbow yarn, which is why I decided to include it on this page. The dark blue/red/green and purple mid section and the top green/blue/gray/red section are both rainbow yarn. However the mid section also has some dark teal blue angelina spun in which adds just a touch of sparkle. The sparkle unfortunately doesn't show up in the computer image. 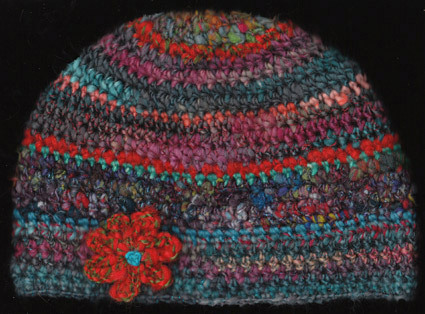 Most of the rest of the hat is a hand painted blend of Merino wool and silk. This yarn varies from dark teal blue to turquoise, magenta, and lavender. Some of it has been plied with red wool thread (upper middle), fine spun red mohair, and dark turquoise metallic thread (both lower section). The metallic thread compliments the angelina above it in the same color. The flower is orange Corriedale wool plied with fine spun green mohair and is the same yarn as the orange stripe near the top. The flower center and the thin aqua and light teal blue accent stripes are tussal silk.